Third Cornwoolly event at Heartlands Cornwall created a woolly buzz! Last Sunday was the third Cornwoolly event at Heartlands – and we had a blast! Over 860 visitors attended the show, thankfully accompanied by sunshine instead of snow this year. There was a fantastic buzz during the day, with visitors thoroughly enjoying the wide variety of creative stalls and demonstrations filling the Chi an Bobel Hall. 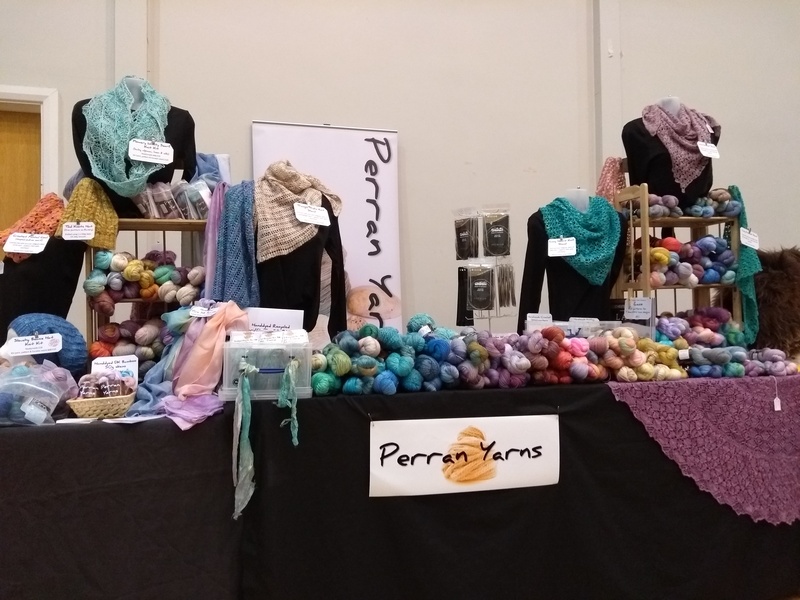 Perran Yarns saw lots of familiar faces as well as new ones, and I had a lovely day chatting to you all. Those of you who brought along projects using previous Perran Yarns purchases – thank you! It’s always fabulous to see what Perran Yarns look like in their finished projects, and helps to shape my thoughts on future yarns and colourways. Customers snapped up our new sportweight Suri alpaca merino blend yarn, as well as the new big 150g skeins of Decadence 4ply BFL silk blend. I can’t wait to see all your project pictures on Instagram and Facebook. Neither of these yarns are available in my Etsy shop yet. I’ve ordered more of the base yarns and will be dyeing them soon. The lovely Flowery Infinity Scarf kit completely sold out! I have more of the gorgeous baby alpaca, linen and silk blend DK yarn on order and will be dyeing that in time for the Wool & Yarn Fest. This yarn has a new name: it was Summer Luxe DK and is now Egyptian DK. It’s new little sister, Egyptian Laceweight, is being crocheted into a beautiful sample by my wonderful sampler team as I type. Now starts the planning for Buckfastleigh Wool Gathering on Sunday 31st March, Mother’s Day! The focus of this show is British wools. I’ll be taking along my various Bluefaced Leicester blend yarns, together with some lovely alpaca produced in Devon, and some of the supersoft John Arbon merino/silk, also produced in Devon.